I think you’re probably setting your fees wrong. Sound harsh? I talk to therapists every day who are working hard, doing excellent work...and not making a good living. The process you use to set your fees is one big factor determining whether you’ll make enough money to feel some financial ease or make just enough to scrape by. When you use the wrong process to set your fees, you’re likely to feel resentful and discouraged about how hard you work and how little you take home. I kind of wish I could reach back into the past and tell the me of 15 years ago to read this article. But here I am now, sharing it with you, and that’s good enough for me. Spoiler alert: I don’t know what your fees should be. Only you can know that. I do have a pretty great step-by step-process to help you figure it out. You also do a little math and decide that you could make enough if you multiply this full fee number by the number of clients you’ll be seeing. If that’s the process you use, you’re not setting this full fee high enough. You’re setting yourself up to barely scrape by. I’ll tell you why this process for setting your fee is failing you. Then I'll offer you a freebie, instructions and a video to walk you through my step-by-step process for setting your fees. Why is the process so many therapists use wrong? The process above is missing some important pieces, so it inevitably leads to you make too little. I’ll go over 3 big pieces you should take into account next time when you set your fees. Missing piece #1: When you set your fees, you didn't accurately account for your sliding scale. If you don’t have a sliding scale, you can skip this missing piece. Sliding scales are great! I use one in my own therapy practice. Most therapists set them up badly. Most therapists set their full fee using the factors I named above, and then make adjustments down from there on a case-by-case basis. You might think that the fee at the bottom of your sliding scale is the problem. I think your problem is more likely the fee at the top of your sliding scale, your full fee. Your full fee is the problem because you didn’t set it high enough. You need to set the fee at the TOP of the scale high enough that your average fee gives you financial ease. With a sliding scale, fees only go down from your full fee. If you set your fee at 150, your next client isn’t going to say, “That feels too low for me. I’d like to pay $200 because my income is really robust right now and I have a trust fund.” It would be unethical for you to accept more money even if they said it. You need to set your full fee high enough that every time you adjust your fee, you’re confident that your average fee will work for you. Otherwise your only way to change your average fee is to slide less. Getting rid of your sliding scale all together is a valid choice, but it’s kind of a sad choice. Wouldn’t you rather set your full fee high enough that you could easily afford to hold on to some lower fee spots? Wouldn’t you like to be able to slide significantly for a client you’d love to work with who has very little income? Missing piece #2: You underestimated the interruptions in your schedule. You calculated your fee based on a full schedule. A full schedule is not how life works all the time. Cancellations, attrition, vacations, illnesses and other interruptions all impact the number of sessions you have. Almost all therapists UNDERESTIMATE how many interruptions happen in their schedules. When you underestimate how many times you DON’T see all of your clients in a given week, you’re always financially stressed about cancellations and attrition. You’re always a bit hesitant to take time off. When you add up your income, it falls a little short of what you hoped. When I ask a therapist how many sessions they have per week, they usually tell me the number of sessions they have regularly scheduled. I suggest that you track your actual number of sessions. It’s easy. You can do it now. Just take the past 3 months, add up the number of sessions that actually happened, and divide by the number of weeks. If your practice isn’t full yet, get realistic about how many sessions you will feel comfortable having each week, taking all of those inevitable interruptions into account. You can also adjust your office policies and enforce them to decrease how much these interruptions hurt your business. By the way, you need to take vacation and sick time. It isn’t actually something to be proud of if you never take a sick day. We therapists need self-care just like all other humans. Savings? That’s something we therapists often leave out. When I was setting my fees early on, I don’t think I even used the word savings. Savings is the path to financial ease in your business and in your personal life. You probably left out or underestimated the savings you need when you set your fee. Let’s start with personal savings. You deserve to put away some money before you pay your bills. Then there’s business savings. Yep, you deserve to build savings for your business too. Occasional business costs come up that aren’t in your regular business budget. When you add up your anticipated business expenses, it’s easy to forget stuff. Unexpected expenses and opportunities come up now and then. You need a new sofa for your office. A once in a lifetime training is happening in your town. Your lease is not renewed so you need a new office deposit. A bill you forgot about came in the mail. Your website needs an overhaul. If you add them all up, these occasional costs actually come up often. Sometimes a bunch of them happen at once. Imagine having that money already sitting in your business savings account before those expenses come up. Ah, peace! It’s time to get ready to set your fees in a new way. Get my step-by-step instructions below. You'll get a video and worksheet walking you through the simple process. Is your bookkeeping system (really) set up well? I thought my bookkeeping systems were great. Then I learned how my bookkeeping could be doing much more for me and my business. Your therapy business is relatively simple, so you might think you don’t need any help from a bookkeeper. You can do all of your bookkeeping yourself. Here’s the thing: There’s a difference between getting ongoing help from a bookkeeper and getting help from a bookkeeping trainer. Now I am totally converted to the idea that we all need some help from a bookkeeping trainer. I thought I was doing everything correctly with my financial systems. I keep my own books and I probably always will. If you are familiar with this blog, you know that I love systems and I love to track. I track every dollar that comes in and every dollar that goes out. I’ve got a business budget and projected earnings for my practice. I LIKE to take a few minutes every day and a couple of hours every month to track my money. I don’t need a bookkeeper to take over my daily and monthly financial tracking. My accountant doesn’t complain that my business figures are missing anything. So far I’ve avoided working with a bookkeeper. I’m self taught. I do things the way I do them. I don’t need any help! (I always thought). I sat down with bookkeeper and bookkeeping trainer Andi Smiles recently, and I started to question that. With her open smile, lavender hair, and unique personal story, she made me feel comfortable right away. I met with Andi because I was looking for a fabulous bookkeeping trainer to guest teach in my Superpower Method For Therapists™ Program. I wanted a pro to guide my therapists in setting up their bookkeeping systems correctly and to answer all of their bookkeeping questions. I wanted to find the right bookkeeper; someone who would fit with the safe energy that my groups tends to have, and who would not scare my wonderful therapists away from looking at their finances. Two of my awesome therapist clients had loved working with Andi. When Andi told me about her approach to finances, I knew we had found our woman. She wants small business people to develop loving and transparent relationships with their finances. She’s about empowerment rather than fear or intimidation. How do I deal with credit card fees on my schedule C at tax time? What exactly can I claim as a business expense? What kind of bookkeeping system is best for my simple business? What’s the best way to pay myself? Andi told me how she would answer all of those questions. Not only did I love the way she answered, but I also realized I wasn’t keeping my own books in the most effective ways. I’ll be taking notes along with the other therapists. In the Superpower Method For Therapists™ Program, she’ll take the reins for an entire lesson. She’ll teach the foundation of how to set up the bookkeeping systems for your therapy business. Then she’ll talk to our small group for 90 minutes on a Q and A call to answer individual questions. Even if you don’t sign up for the Superpower program (starting next month), I want you to get some help from Andi. I’ve invited her to co-present a free online workshop for you. We’ll focus on just one important area of bookkeeping in this free online workshop: claiming expenses for your taxes. You want to claim everything that you can, because you want to take home as much profit as you can. On the other hand, you want to be very clear that everything you are claiming is legitimate. If you ever get audited, you want to know you’ve claimed expenses correctly. Andi will show us how to do that. Claim your spot and be there. Remember, it's free! Don’t worry if you can’t be there live. Sign up and you’ll have access to the recording for 48 hours after the workshop. Sorry, you missed the workshop, but sign up right here to get practice building help dropped in your inbox each week. I’ll never share your email address. You can easily unsubscribe any time. You'll know about the next training too! If you’ve got a private practice, you've got a very small business. That means that if 5 clients graduate from your practice in the same month, you’ve lost a big chunk of your income. If you get sick and need to miss a week of work, you’ve lost a big chunk of your income for that month. If referrals slow down for a period of time, you may have a lean month. The first time my therapy practice declined, I panicked. My inner critic let me have it, and I didn’t have enough experience to know that this was one lean moment in a growing business. Because I didn’t have that perspective, I also didn’t know how to make practical decisions about my business. I’m happy to say that I don’t panic in my business anymore. I know how to plan for the leaner times. You can plan for those lean times too. How do you do that? I’ve got a mindset answer and a practical answer. You’ve got to learn not to take it personally when you’re in lean times. You’ve got to learn not to panic and not to make any impulsive decisions based on that panic. Your inner critic will grab on to lean times as an opportunity to let you have it. You were silly to think this would work out. You’re never going to make this work. This is the beginning of the end for you. This decline in income is a reflection of your value. I’ve got a strategy to make this business work. I expected this to happen, and I can handle it. This is a blip in a long-term business. There may be something to learn from this, but it isn’t about my value. In order to move towards that mindset, get support from a coach or from people in your life who have succeeded in business. Now for the practical answer. Plan for cancellations, illness, vacation, and attrition. Cushion your schedule so that you have more openings than you may think you need. This helps you make up for those times when you will have fewer sessions. Plan to have a few more sessions than you think you need to meet your income goals. Plan to make 10 or 20% more than your goal, and that will make up for the months when you don’t hit your goal. Financial wizard Suze Orman often says that people need at least a 6-month emergency fund. Your private practice needs its own emergency fund. As soon as your practice is full, start putting away just a little bit each month until you have at least 2 months of practice income saved. That cushion will help you make good decisions when the next lean time comes. You’re not likely to lose all of your practice income at once, so a 2-month fund will take you a long way. Maintain your boundaries and your policies in lean times. Don’t get loose with your policies or fees in an attempt to keep or bring in clients. Those mistakes will only make it harder to build and maintain a solid practice. Use your lean months to market your practice. I talked last week about the importance of investing in your practice. In lean months, don’t cut back on marketing. When you’re sick, you eat the healthiest food so that you can get well quickly. Treat the lean times in your practice that way too. Need help building your practice? Apply for a free consultation now. For five weeks, I’m talking about the most common money issues that hold therapists back in private practice. Last week I helped you identify how you may be looking away from the financial realities of your business. This week I’m talking about the issue of not investing in your business. When you invest in your business, you give it the nutrients it needs to grow. Some ways therapists invest in their businesses are furnishing a nice office space where their clients can feel comfortable, paying for the best ongoing clinical training, hiring a business coach, hiring a professional to help you create a client attracting website, or paying for practice management software. These are investments rather than just ways to spend money because they help you attract and serve your ideal clients. They help you grow your business rather than just maintain the business you already have. A lot of therapists say they will invest in these things when they have more money. The problem is that it takes a long time to earn more money if you don’t you’re your businesses the nutrients it needs to grow. Are you afraid to invest in your business? If you’re making decisions about your business from a mindset of fear, scarcity or deprivation, it’s hard to invest. Picture your business as successful and profitable. Picture yourself as a therapist serving plenty of your ideal clients, perhaps with a wait list. Now think about the investment you are considering. Does it support that vision? Does it bring you to that reality more quickly? If it does, invest as much as you can. If not, invest elsewhere. When I hired my current business coach, I couldn’t easily afford her. As I was making the decision of whether or not to sign up with her, I used the process I’m describing here. I asked myself if working with her would support the vision I had of my business. I asked myself if working with her would help me earn more than what I was investing. My decision became easy, and I signed up. I’m not suggesting you spend thousands of dollars creating a fancy website or buy that most expensive sofa. I am suggesting that you follow your calmer, wiser inner voice and strategically and mindfully invest in the future of your practice. Is it time to build your practice in a big way? Apply for a free consultation now. For 5 weeks, we’re looking at the common money issues that hurt therapists in private practice. Last time we looked at your money set point, the amount of money you expect to earn. Now we’ll talk about another money issue that holds therapists back: Looking away from your money reality. If you have this money issue, you don’t know about your money reality and you don’t want to know. You are using denial to deal with your fears about money. As therapists, we know how well denial works. Not so well. How much did you earn last month? How much are your monthly business expenses? Do you have any uncollected fees? How many people contacted you to ask about working with you last month? Are your numbers easy to assemble at tax time? If you can’t easily get at the answers to some of these, and if your heart rate just sped up in reading the questions, you may be looking the other way about your money. Looking honestly at your finances is kind of like getting a colonoscopy. Whatever you find, you’re better off knowing. Even if you think you can’t handle the truth, I know you can. It may be painful and it may bring up shame. That’s so normal, and you are in good company. 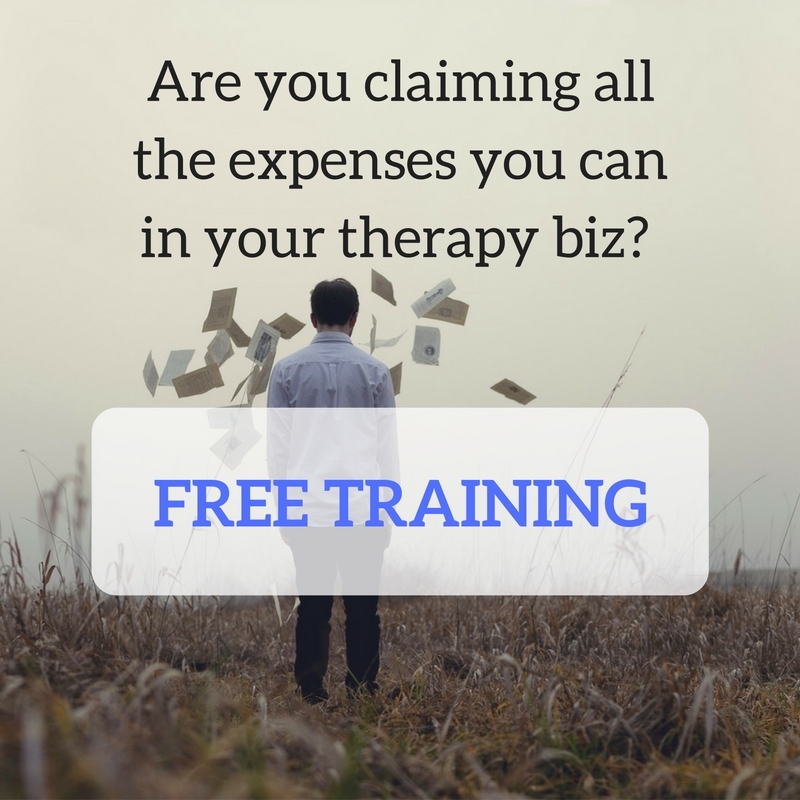 I have helped a lot of therapists work through that shame so they can take charge of their finances. Facing the reality of where you are right now leads to freedom. When you stop putting energy into keeping the truth out of sight, you get to use that energy for growth. You lose that creeping feeling of guilt that says “I really should look at my numbers” and you gain the ability to make better choices. I worked with a woman who hated looking at her money. She didn’t know the answers to any of the above questions. At first she insisted on building her practice without getting a clear look at her finances. She had a little bit of success with that approach, but fairly quickly leveled off in her income. Then I encouraged her again to look at her finances while leaning on my guidance. She found out how much she was spending, how much she was earning, and what her actual average fee was. This helped her understand what she needed to earn to have more than enough and live with more financial abundance. This knowledge gave her the motivation she needed to raise fees for new clients and market her practice with more energy and consistency. This is what she needed to break through that income barrier and make a good living. It took courage as well as support. If you need some help breaking through an income barrier, apply for a free consultation and find out how I can help. I’ve got group and individual programs to help you bust through your money issues and grow your practice. You help your clients work through money issues, but you may not have worked through your own. If you are in private practice, then you are a business owner. That means it's crucial that you work through those issues. Sometimes therapists focus solely on the clinical side of private practice. That's understandable. We didn't become therapists for financial reasons. The business side of your practice also needs attention and respect. If you don’t work through your money issues, you won’t do well as a business owner, no matter how wonderful you are as a clinician. In this series I will go through the top 5 money issues I see therapists struggling with in their private practices. When I help therapists work through these money issues, they are able to dramatically increase their earnings. The first money issue is having a low earning set point. How much do you believe you can and should earn as a therapist in private practice? This is your money set point. You may think you know your set point, but your body will tell you for sure. Keep increasing that number and listen to your body. Your set point is the place where you begin to feel uncomfortable. You’ll feel some tightness in your chest or a pit in your stomach or perhaps tension in your neck. It is very unlikely that you’ll earn more than your set point. Even if opportunities are right in front of you that could bring you above that income level, you unconsciously sabotage those opportunities. Perhaps you sabotage your earning potential by keeping your fees low, showing discomfort when you discuss fees, getting sick so that you have to miss work, or forgetting to call a potential client back for a few hours. The opportunities for sabotage are endless, aren’t they? It is not safe to earn more than this. My friends or family will not like me. I will mismanage it. I won’t know who I am. I don’t deserve to earn more than this. I am not worthy of more than this because I’m not smart enough, or (fill in the blank) enough. I would be disloyal to (fill in the blank) if I earn more than this. I have an unspoken agreement to keep my income lower than this. Identify the fears and beliefs that are keeping your set point low so that you can release them. Tune back in for the next 4 weeks to read more about the money issues that might be holding you back. Is it time to build your private practice in a big way? Apply for a free consultation with me now. Do You Feel Good About Your Cancellation Policy? How’s your cancellation policy working for you? If you have any negative feelings when you read that question, keep reading. I want you to feel so good about your policy that you feel warm and connected to yourself and to your clients when you talk about it. Your cancellation policy is a clinical issue. The way you feel and talk about your policy will affect your relationships with your clients. Do you feel comfortable enforcing your policy? Do you go over the policy carefully with each client in session and make sure they understand and agree? Do you ever feel apologetic about your cancellation policy? Do you feel clear about when, if ever, you make an exception to the policy? How do you feel when you charge for a missed session? I don’t advocate one particular policy for every therapist. Your practice is unique, and how you set that policy is an individual decision. The key is that your policy is aligned with your values so that you can enforce them consistently and without giving a mixed message. Here are a couple of examples, one where a policy works, and one where it doesn’t. I worked with a therapist whose policy was that her clients could miss four sessions per year and after those four missed sessions, they had to pay for any additional missed sessions. The amount of notice did not matter. This policy worked for her because she believed it had value for her clients. She believed they got more out of therapy by making such a big commitment. She welcomed conversation about this policy and was comfortable processing her clients’ feelings about it. My second example is a therapist with a therapist who had a 24-hour cancellation policy. She rarely enforced it. She felt guilty about charging for sessions when her clients cancelled at the last minute or didn’t show up. She worried that they would be upset with her. In our work together, she decided to give each client ONE freebie, a chance to cancel with less than 24 hours notice without getting charged. She went over her cancelation policies more clearly and got more comfortable with those conversations. As we’re getting close to the beginning of a new year, examine your policies and how well you’re communicating about them. If you only make that one change at the beginning of the year, it might make a big difference in your practice. If you need some help getting clear about your business strategy, apply for a free consultation now.